The Black Skull was once a plateau that rose above a great desert in a land across the sea. It was the original home of the Laughing Skull Clan, before they were joined with the Horde and called down from their plateau to remove the draenei from the Fields of Farahlon. Prior to the First War, the clan was led by a scheming orc, who was nonetheless ready to pledge his clan’s full support to the larger Horde and sought to reshape Farahlon to resemble their old home. An ogre mage named Mogor, however, foresaw that the war would only splinter and destroy the clan. When the chieftain did not heed Mogor’s warnings, the ogre assassinated the orc to gain control of the clan. Mogor attempted to keep his clan out of the war as much as possible, despite some detractors supporting the position of the old leader. To kill two birds with one stone, he sent an agent named Obris, who supported the Horde, to support the effort and dedicated enough resources to appease Ner’zhul and the other leaders. No matter what he gave, however, the Horde always seemed to want more and more. Fearing the end of his clan to the wars on Azeroth, Mogor eventually established a connection to the Alliance that fought back against the Horde. Little came of the connection, however, but the Laughing Skull Clan would still ultimately serve the Alliance in the Second War. The orc Obris ultimately realized that Mogor was right about Ner’zhul, and in his dying moments was able to give the Alliance Expedition the Book of Medivh, an artifact they needed to close the Dark Portal and save Azeroth from the destruction that had begun to tear Draenor apart. 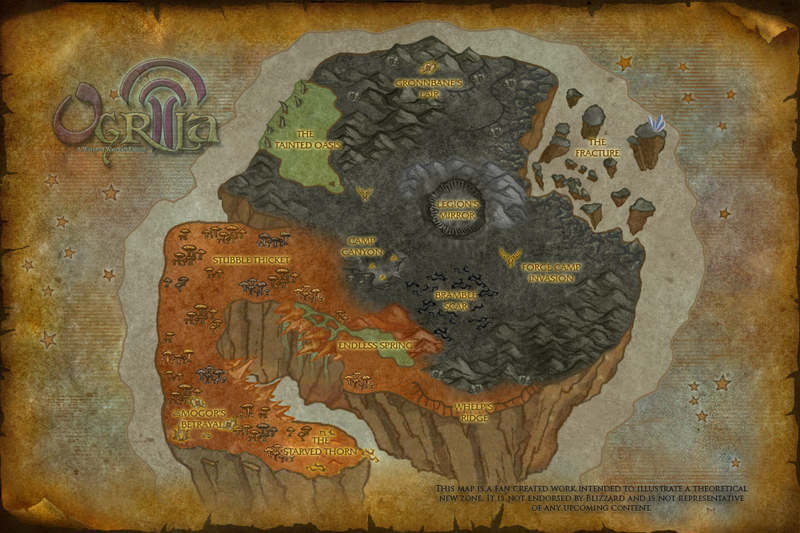 When Draenor exploded and became Outland, the Laughing Skull Clan’s home in Farahlon was destroyed and became the Netherstorm. Meanwhile, Mogor was stranded on the mainland, where his Horde agents slowly fell to the influence of the Pit Lord Magtheridon. However, the original home of the Laughing Skull Clan survived, now as a broken island drifting in the Twisting Nether. Not every member of the clan traveled to Farahlon, and now they were trapped on a small island with quickly diminishing resources. Things would turn even darker when the Burning Legion emerged from the Nether and gained a foothold on the island. Many orcs and ogres of the clan, seeing no other option, joined with the Legion and drank their fel blood. Now on the verge of extinction, the existence of a Legion portal on the Black Skull has drawn the attention of the Alliance and Horde to the island. Desperate for any relief from starvation and the Legion, the remnants of the Laughing Skull Clan join with the Alliance and Horde to fight back against the Legion. When players first arrive on the Black Skull, through a flight path event, they are tasked with securing the favor of the Laughing Skull Clan. Desperate, the clan does not care for the divisions between Horde and Alliance, and simply want relief guaranteed before they can lend any relevant aid to the fight against the Legion. The player clears a path in the Starved Thorn to place signal flares for relief shipments. Once a support beachhead is established, the player helps the clan clear the Stubble Thicket of invading fel orcs and fel ogres. Afterward, the player discovers that an eredar warlock is corrupting the elementals that create the Endless Spring, one of the clan’s last sources of water. The player defeats the eredar, but find that the Legion is still too strong for a frontal attack. The Laughing Skull Clan informs the Horde and Alliance of a series of caves and tunnels that were inhabited by black dragons during the Second War, that could provide an alternate path to the Legion’s position. The player will enter the tunnels to find them filled with corrupted horrors and mutants of all sorts, before emerging in the Bramble Scar. Here they will fight with heroes to pass through the mazelike bramble, filled with corrupted flayers, ravagers, and demons, before coming upon a Legion camp in a canyon. Now with the tactical advantage, the Horde and Alliance forces assault the camp and capture it for their own. From there, the Alliance, Horde, and Laughing Skull forces decide to deny the Legion of resources. The player follows as the battle moves to the shores of the Tainted Oasis, now being corrupted and harvested by the Legion for their own nefarious purposes. The Legion machines are destroyed and the elementals of the oasis are freed, but the Horde and Alliance realize that the facility was being used to corrupt a great black dragon that had hidden away on the Black Skull during the Second War. The fel dragon attacks Camp Canyon, while the player is sent to its lair to prepare for its return. During the fight, the player is forced to mount the dragon as it goes on another rampage. Here it will fly around the Fracture until it is defeated, and crashes on the furthest island. On the island is an ogre from Ogri’la, who agrees to fly you back to the mainland on one of his nether rays, but suggests a new plan of attack. With their new ally, the player takes a nether ray into the back of Forge Camp: Invasion and begins sabotaging various parts of the infrastructure, before ultimately fleeing back to Camp Canyon on the Nether Ray. Now that the Legion operation on the Black Skull has been destabilized, the Alliance, Horde, and Laughing Skull Clan mount a final assault on the Legion’s Mirror. A great battle ensues as the player wades through the fights to reach the Legion portal itself. Here the player will help other heroes defeat a major demon and secure the portal. Once the battle is over, the portal will be surrounded by friendly magi, and it will be used to take the battle to the Legion. There not much hope here, (name). If you think we have chance, though, maybe you can go out there and help. We trapped back here because there a line of fire mouths on hill. If you stop them, maybe we can breathe sigh of relief. We shaman know why the Spring and Lake are endless. If you wish to see for yourself, maybe you will be granted some power. Start at the Endless Spring. There’s a hole at the bottom, swim through it to an underground cavern, then you will know why the water does not stop. The Black Skull is a new floating island off the “coast” of Outland. The island is vaguely shaped like a skull with a jaw that’s barely hanging on. The players start at one end of the skull and quest around the face of it before reaching the center. The zone will provide a fresh look on Outland, based more on the look of Draenor from Warcraft II. It will appear as a harsh world with mushroom forests, before reaching a twisted wasteland showing exactly the power of the Legion on nature. However, it will not be too alien, to show more of a contrast to the strange worlds on the other side of the Legion’s portal. Players will start in a small town called Mogor’s Betrayal, a series of primitive huts and ogre mounds deep in the Stubble Thicket. This forest is made from a dark, brown and gray species of giant mushroom, more akin to those seen in Warcraft II than in Zangarmarsh. This forest spreads across the lower half of the Black Skull’s jaw. To the east of Mogor’s Betrayal, you find the Starved Thorn, once a place of training for the ogres, they have been forced to hunt the creatures there to extinction. On either side of the Black Skull’s jaw are the Laughing Fangs, a stretch of rocks akin to those in Blade’s Edge Mountains. On the upper jaw, you find water pouring through the laughing fangs, originating from the Endless Spring, a mysterious source of water that never seems to exhaust. Following the cliffs from there, you come to the Whelp’s Ridge, a small span of rock now filled with mutants resulting from the runoff of both Legion and old Black Dragon experiments. To the northeast of the jaw, there is a small gorge with a garrison known as Camp Canyon that the Legion has reinforced heavily. The Bramble Scar, to the east, is an area so overgrown with twisted thorns that it is essentially a maze. The Tainted Oasis, another sea of mysteriously endless water, is filled with Legion technology. East of the lake is a steadily inclining rise topped by Gronnbane’s Lair. Gronnbane was once a powerful black dragon who tangled with the gronn of Blade’s Edge Mountains before retreating when its fellows were being hunted down. On the opposite side of the ridge is the Fracture, a section of the Black Skull broken off not with the rest of the landmass, but due to the Legion’s experiments. A large Apexis Crystal can be seen on the furthest floating island in the Fracture, and some say that the ogres of Ogri’la visit it from time to time. The Legion that fractured the Skull are based in Forge Camp: Invasion, just south of the Fracture. Guarded by many elite Legion commanders and fel cannons, the position has been untouchable by the ogres, but worse yet is the reason why the Forge Camp is even there in the first place, the Legion’s Mirror. Appearing as the single eye of the Black Skull, the Legion’s Mirror lies in a crater that was formed when a mysterious object from the depths of the Twisting Nether crashed into the Skull. The Burning Legion harnessed the object to create a portal they’re beginning to utilize to bring in more troops from their distant homeworlds. If left unchecked, they could bring massive amounts of reinforcements to Outland and then, to Azeroth.